Driveways can take up a lot of front yard real estate but are rarely given as much thought as other areas of the garden. Instead of seeing the area as simply a track for cars, look at the driveway as an opportunity to increase curb appeal and set the tone for your front yard. 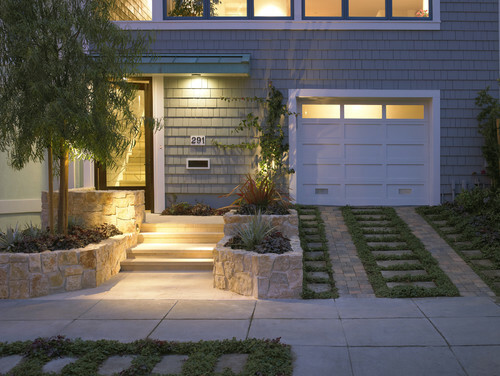 Here are eight examples of driveway materials and placement that go beyond the usual pavers, cobbles and gravel to complement different styles of front yards. 1. Linear pattern play. Give a classic driveway material, such as poured concrete, a twist with a pattern that makes a design statement. 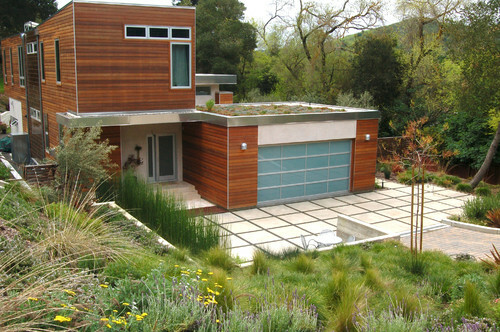 This concrete driveway was poured in a linear pattern, leaving gaps for planting plugs of turf. The finished effect reads almost like an oversize bar-code pattern and complements the home’s clean lines. 2. Eco-friendly. Traditional paved driveways contribute to rainwater runoff, rather than draining water on-site. 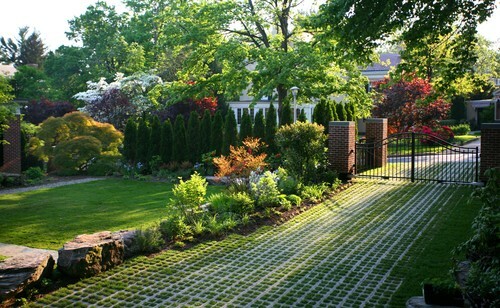 This permeable surface in Maryland shows a much greener alternative. The designer laid pavers designed with hollow centers and then planted them with plugs of blue fescue (Festuca glauca) sod. The driveway visually melds right into the front lawn and can be mowed to keep fescue low. 3. Contemporary geometry. Set a graphic theme to the front yard with a driveway made up of a repeating pattern of shapes and lines. For example, this geometric driveway transecting a low-water landscape is composed of narrow rectangles of concrete set in a compacted base and then surrounded with crushed limestone. 4. Green strip. Break up an expanse of driveway paving and increase permeability by removing stones and replacing them with planting pockets. 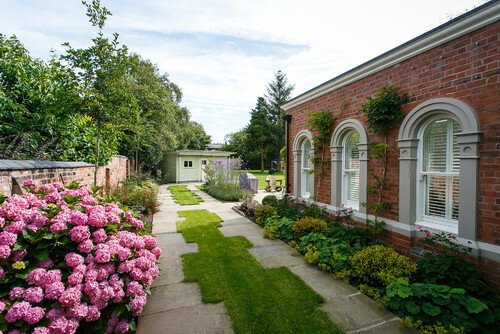 The architects of this driveway in Manchester, England, created an irregular edge for the green strip by leaving the outer paving stones of various sizes in place as wheel tracks for cars. Plant the interior strip with lawn or a walkable ground cover such as Roman chamomile (Chamaemelum nobile), silver carpet (Dymondia margaretae) or woolly thyme (Thymus pseudolanuginosus). 5. Courtyard driveway. Treat your driveway more like a courtyard by extending the footprint beyond the edges of the garage and choosing a stylish paving material. In this Northern California landscape, the architect used a grid of light concrete pavers to form a graphic courtyard at the front of the home. Gaps left between the pavers promote drainage. The area acts as a walkway to the front door and a space for an outdoor table, as well as a car-friendly surface to connect to the garage. 6. Permeable bands. 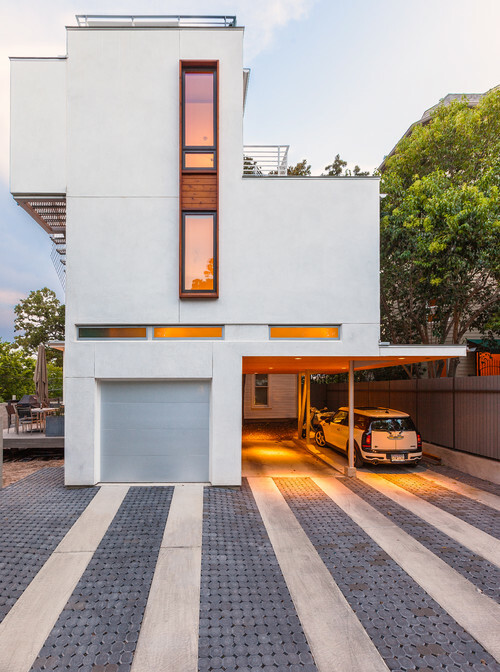 Rather than covering the driveway and carport with concrete, the architect for this home in Austin, Texas, came up with a clever solution to increase permeability and give the surface more visual interest. Alternating stripes of pale-colored poured concrete with dark-tinted concrete pavers (Uni Eco-Stone pavestones) create a graphic pattern and encourage rainwater to drain through the pavers. 7. Postage-stamp garden. On tight city lots, the driveway can take up much of the front yard. 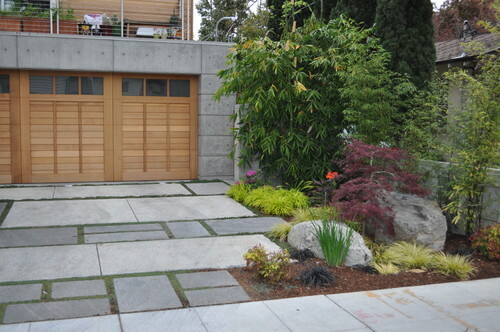 To carve out more space for plants, the architect of this San Francisco front yard left green strips down the driveway and planting pockets between concrete stepping stones. 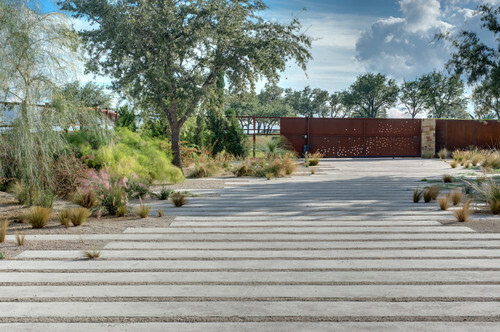 The neutral mixed pavers used for the car tracks and the multiple sizes of concrete steppingstones work well together surrounded by plenty of green. 8. Asian-inspired. Granite slabs and smaller cut stone pavers laid in an irregular pattern work well to complement a modern Japanese-influenced garden. Selecting a paving material that relates to the home’s architecture and complements the planting theme can integrate the look of the front yard. How would you re-design your driveway? Let us know in the comments below! This entry was posted in Home Design and tagged Amarr, amarr garage doors, building products, Entrematic, exterior design, garage, garage doors, Green, home design, home exterior, houzz, landscaping, remodeling, Sustainability, yardwork. Bookmark the permalink. This is cool driveaway design. And I most like the line pattern one. Looks so cool. Great information Lauren!